The sibfl.net home page has new dropdown menus including a SIB Media link which consolidates many communication services. The most recent addition to these is a Vimeo link to a collection of City videos from SIB-TV. Recent changes to sibfl.net include drop down menus on most home page topics. The former Photo Gallery link has expanded to include all media and is now named “SIB Media”. There browsers will find links to the City’s communication network including Islander newsletters, Living magazines and email alerts, plus the SIB TV/Vimeo link. This particular link goes to a new section on sibfl.net, a collection of City videos from SIB-TV, which can now be found online. 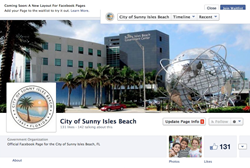 Access the videos from the SIB Media drop down menu on the homepage, or from vimeo.com/cityofsunnyislesbeach. Additionally, the most popular information links are more visible and directly accessible for users browsing the home page. Check out the other new dropdown menus for many of the home page links from Building & Development to City Services to Public Safety. In each case, the “more” link will take you to all the information for that section of the website. These improvements are designed to make our website easier to use and to provide the information our users are looking to find. Continue to follow us on Social Media via: Twitter and Instagram (@cityofsib) and “like” us on Facebook (City of Sunny Isles Beach). Stay up to date with upcoming events, important announcements and traffic alerts. Social media is a great way to stay connected to your community and learn about new services and programs offered by the City. If you have any questions regarding the website please contact Cultural and Community Services at 305.792.1706.